Melatonin for Blood Pressure Reduction? Melatonin taken at bedtime can reduce blood pressure and may be useful for the mitigation of nocturnal hypertension. Melatonin, a hormone produced by the brain, is an important regulator of our circadian rhythm and sleep-wake cycle. Taking melatonin at bedtime is known to improve both the ability to fall asleep and the quality of sleep obtained. However, melatonin also reduces blood pressure and has a host of other beneficial effects. The precise mechanisms by which melatonin reduces blood pressure are not fully understood - but melatonin acts to neutralize free radicals (destructive molecules that damage cells and tissues), and also reduces sympathetic nervous system activity (the part of the central nervous system responsible for the fight-or-flight response). Below you will find the studies done that support this theory. (1) Multiple studies have demonstrated correlations between melatonin and nighttime blood pressure, as well as causal reductions in night time blood pressure by melatonin administration. Nighttime blood pressure is now being appreciated as an important risk factor in cardiovascular disease - and some studies suggest that nighttime blood pressure is superior to daytime blood pressure as an indicator of damage to organs and other life threatening effects of high blood pressure. (2) In one study of 16 elderly patients with high nighttime blood pressure, it was found that those patients whose blood pressure remained high throughout the night, had impaired melatonin secretion during the night, further linking melatonin to nocturnal blood pressure. (3) In two studies of 16 men and 18 women, it was found that chronic ingestion (greater than 3 weeks) of melatonin before bedtime successfully reduced blood pressure during the night. (4,5) At present, it is unclear how strong of an effect reducing nighttime blood pressure has on health and wellness. 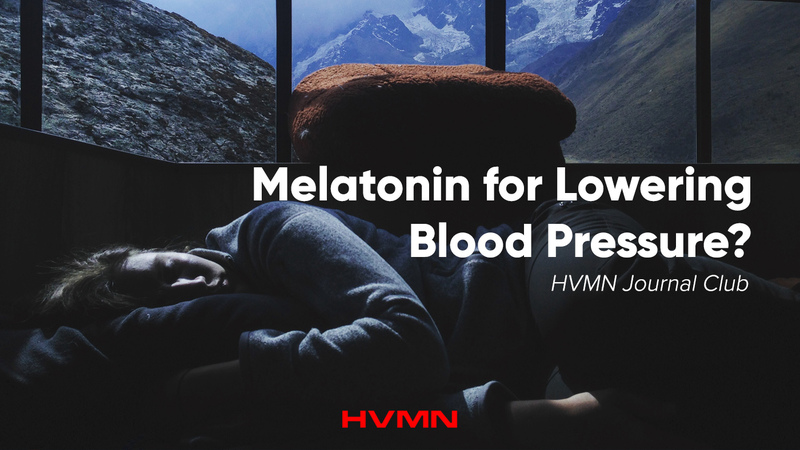 However, nocturnal blood pressure is strongly linked to life-threatening outcomes, and utilizing melatonin can be a key to reducing this risk. By optimizing sleep and lowering nocturnal blood pressure, supplementation of melatonin is likely a good addition to a nootropics and health optimization regimen. One such readily available nootropic that contains melatonin is our YAWN. 1: Pechanova O, Paulis L, Simko F. Peripheral and central effects of melatonin on blood pressure regulation. Int J Mol Sci. 2014 Oct 8;15(10):17920-37. doi: 10.3390/ijms151017920. Review. PubMed PMID: 25299692; PubMed Central PMCID: PMC4227197. 2: Salles GF, Reboldi G, Fagard RH, Cardoso CR, Pierdomenico SD, Verdecchia P, Eguchi K, Kario K, Hoshide S, Polonia J, de la Sierra A, Hermida RC, Dolan E, O'Brien E, Roush GC; ABC-H Investigators. Prognostic Effect of the Nocturnal Blood Pressure Fall in Hypertensive Patients: The Ambulatory Blood Pressure Collaboration in Patients With Hypertension (ABC-H) Meta-Analysis. Hypertension. 2016 Apr;67(4):693-700. doi: 10.1161/HYPERTENSIONAHA.115.06981. Epub 2016 Feb 22. Review. PubMed PMID: 26902495. 5: Cagnacci A, Cannoletta M, Renzi A, Baldassari F, Arangino S, Volpe A. Prolonged melatonin administration decreases nocturnal blood pressure in women. Am J Hypertens. 2005 Dec;18(12 Pt 1):1614-8. PubMed PMID: 16364834.